A trip to the Caribbean wouldn’t be complete without live music. 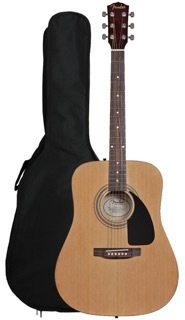 So surprise your loved ones with your hidden musical talents using our newly-acquired acoustic guitars. Includes a spruce top with Xbracing for full and resonant sound, body binding, exclusive Fender headstock shape, Fender pickguard, smooth-playing 20-fret rosewood fingerboard, rosewood bridge with compensated saddle, forward strap button with internal block reinforcement, and chrome hardware. Package includes an extra set of strings and carry bag.